Todd Gurley II (born August 3, 1994) is an American football running back for the Los Angeles Rams of the National Football League (NFL). He played college football at Georgia where he earned All-SEC honors in 2012 and 2013. Gurley was drafted by the Rams tenth overall in the 2015 NFL draft. Despite missing three games due to a torn ACL suffered during his junior year at Georgia, Gurley rushed for 1,106 yards in his rookie season and was voted Offensive Rookie of the Year by the Associated Press. Gurley attended Tarboro High School in Tarboro, North Carolina, where he was a three-sport star in football, track and basketball. He played as a running back and defensive back during his junior season, totalling 1,472 rushing yards and 26 touchdowns, as well as 79 tackles, an interception, and a forced fumble. He was named Rocky Mount Telegram All-Area Offensive Player of the Year for the 2010 season. As a senior in 2011, he was the North Carolina Associated Press Player of the Year after totalling 2,600 yards and 38 touchdowns. Gurley helped his team win the 2A North Carolina state championship, rushing for 242 yards and four touchdowns in the championship game against Lincolnton High School. In the semifinals, Northside had shut down the state's leading rusher, Northside's Shaquan Johnson, who entered the game with 3,083 rushing yards. Gurley was also a world-class hurdler and sprinter for the school's track & field team. He competed for Team USA in the 110-metres hurdles at the 2011 World Youth Championships in Athletics, where he placed 3rd in the prelims with a career-best time of 13.66 seconds, but finished 15th overall in the semifinals. Also a top competitor in the 100-meter dash, he ran a personal-best time of 10.70 seconds in the prelims of the 2011 NCHSAA 2A State Track Meet, placing 2nd. Gurley was rated as a four-star recruit by Rivals.com and was ranked as the fifth best running back in his class. He committed to the University of Georgia to play college football. "Georgia Football Commitments". Rivals.com. Retrieved 2016-07-16. "2012 Georgia Football Commits". Scout.com. Retrieved 2016-07-16. "Scout.com Team Recruiting Rankings". Scout.com. Retrieved 2016-07-16. "2012 Team Ranking". Rivals.com. Retrieved 2016-07-16. Gurley began his freshman season backing up redshirt sophomore Ken Malcome. In his first career game he rushed for 100 yards on eight carries with two touchdowns and also returned a 100-yard kickoff return for a touchdown. Gurley took over as the starter the second game of the season and rushed for 65 yards on 10 carries. Overall Gurley started 12 of 14 games and rushed for 1,385 yards on 222 carries with 17 touchdowns. Against Georgia Southern, Gurley became the second true freshman in Georgia history to rush for 1,000 yards, the only other being Herschel Walker in 1980. 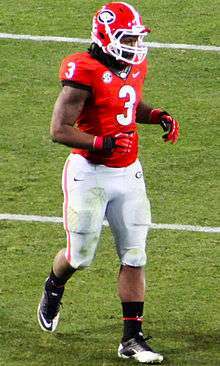 After the season, Gurley was named First-Team All-SEC by the Associated Press. He was one of two true freshman running backs to accomplish this in 2012, the other being T. J. Yeldon of Alabama. In Georgia's season opener (which was played on August 31) at Clemson's Memorial Stadium, Gurley led the Bulldogs with 154 rushing yards, a career high, on 12 carries and 2 touchdowns. Even though the Bulldogs lost the game 38-35, Gurley had an impressive performance against Clemson which included a 75-yard touchdown run early in the first quarter. In 10 games, he rushed for 989 yards on 165 carries with 10 touchdowns. After the season, Gurley was named Second-Team All-SEC by the Associated Press. In the spring of 2013, Gurley joined the Georgia Bulldogs indoor track team. He competed in the 60-meter hurdles, and recorded the seventh-fastest time in school history at 8.12 seconds, to take sixth at the VT Elite Meet. On October 9, 2014, Gurley was indefinitely suspended by the University of Georgia over Gurley's alleged violation of NCAA rules. It only took two days of investigation to determine that Gurley had received $3,000 over two years for signed autographs and memorabilia. Gurley would miss the Missouri and Arkansas games before the NCAA upheld its decision to suspend Gurley for four total games. Gurley sat out for two more games until he was eligible to play against Auburn. In his first game back from suspension in November, Gurley tore his ACL, ending his junior season. He finished the year with 911 rushing yards and nine touchdowns. In Week 9, Gurley was held to just 89 yards in the Rams' 21-18 overtime loss at Minnesota against the Vikings. In Week 10, Gurley was contained to just 49 rushing yards in the Rams 37-13 loss to the Chicago Bears. In Week 11, Gurley rushed for 66 yards in the Rams vs Ravens game and scored 1 touchdown in the team's 13-16 loss. In Week 12, Gurley ran just 19 yards in the Rams 31-7 loss to the Cincinnati Bengals. The following week, he was held to just 41 rushing yards on 9 carries in a blowout loss at home against Arizona. In Week 14, Gurley rushed 140 yards in the Rams 14-21 win over the Detroit Lions. In Week 15, Gurley rushed for 48 yards, scored a touchdown and became the third rookie in Rams history to rush for 1,000 yards in a season after Jerome Bettis and Eric Dickerson in the Rams 31-23 victory over the Tampa Bay Buccaneers (in what was the franchise's last home game in St. Louis before moving to Los Angeles for the 2016 season). In Week 16, Gurley rushed for 85 yards in the Rams 23-17 victory over the Seattle Seahawks and becoming the second Rams rookie to rush for 1,000 yards and 10 touchdowns since Eric Dickerson in 1983. On December 22, 2015, Gurley was selected to be part of the 2016 Pro Bowl along with fellow Rams players Aaron Donald and Johnny Hekker. Gurley was one of the five rookies to be selected to the Pro Bowl, along with Kansas City Chiefs cornerback Marcus Peters, Seattle Seahawks wide receiver/kick returner Tyler Lockett, Oakland Raiders wide receiver Amari Cooper, and Tampa Bay Buccaneers quarterback Jameis Winston. In the first two weeks of the 2016 season against the San Francisco 49ers and Seattle Seahawks, Gurley was held to just a combined 98 yards in both games. In Week 3 against the Tampa Bay Buccaneers however, Gurley had 28 carries, 2 touchdowns, and rushed for 85 yards. In Week 4, Gurley averaged 36 yards but caught a 33-yard pass from quarterback Case Keenum in the Rams 17-13 victory over the Arizona Cardinals. ↑ Welch, Ryan (December 21, 2011). "Tarboro High School Senior named NC player of year". Time Warner Cable News. Time Warner Cable Enterprises. Retrieved 13 October 2014. ↑ Stevens, Tim (July 6, 2011). "Gurley competing in junior world track championships". newsoberver.com. Retrieved 13 October 2014. ↑ "NCHSAA 2A State Track Championship". NC Runners. MileSplit. Retrieved 13 October 2014. ↑ "Georgia 45, Buffalo 23". Chicago Tribune. Sep 1, 2012. Retrieved 16 July 2013. ↑ "Todd Gurley stats". ESPN College Football. ESPN. Retrieved 13 October 2014. ↑ "Todd Gurley Bio, Track and Field". Georgia Dogs. CBS Interactive. Retrieved 13 October 2014. ↑ ESPN News Services (October 9, 2014). "Georgia suspends RB Todd Gurley". ESPN.com. Retrieved October 9, 2014. ↑ Mike Huguenin (November 5, 2014). "Todd Gurley investigation took just two days, Georgia AD says". NFL.com. Retrieved June 28, 2016. ↑ Towers, Chip (October 29, 2014). "Suspension of UGA's Todd Gurley extended 2 more games by NCAA". The Atlanta Journal-Constitution. Retrieved October 29, 2014. ↑ "NFL Events: Combine Player Profiles – Todd Gurley". NFL.com. ↑ Burke, Chris (April 30, 2015). "St. Louis Rams select Todd Gurley No. 10 in 2015 NFL draft". Sports Illustrated. Retrieved May 1, 2015. ↑ Wagoner, Nick (November 2, 2015). "Todd Gurley sets mark for most yards in first four starts". "ESPN". Retrieved November 4, 2015. ↑ Wagoner, Nick (November 5, 2015). "Todd Gurley's jersey, cleats now on display at Hall of Fame". "ESPN". Retrieved January 19, 2016. ↑ "Todd Gurley College Stats". Sports-Reference.com. ↑ "Todd Gurley NFL Stats". Pro-Football-Reference.com.